This is the title of the exhibition on display last Sunday in the rooms of Palazzo Cerio in Piazzetta, organized as part of the Capri Grand Tour 2011 by the Culture Department of the City of Capri in collaboration with the Centro Caprense Ignazio Cerio. 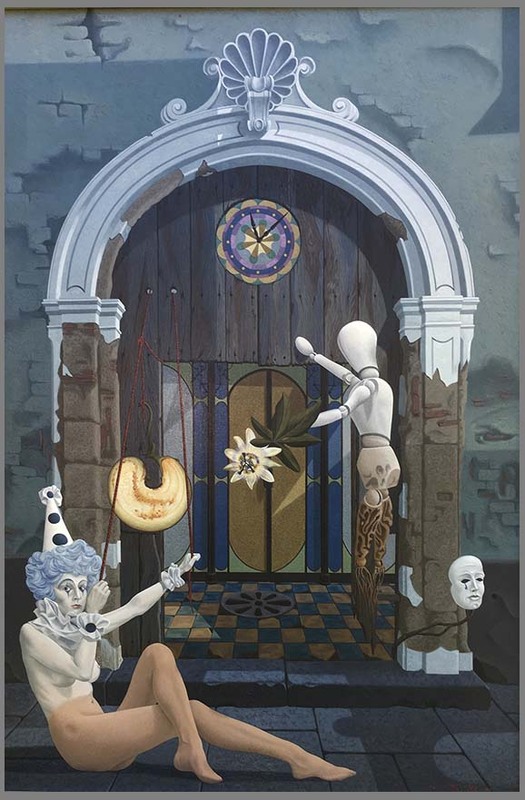 The paintings are those of Ugo Di Martino, the Caprese painter, pupil of Mario Labocetta and of a pictorial surrealism that looks at the forms of Magritte and Dali. Ugo, like a pirate, every year he takes his corsair route that from the coasts of Calatafimi-Segesta takes him back to his beloved blue island that remains the central theme of his works, between dreamlike and surreal landscapes. His is a painting that breaks down the image, rendering its multiple aspects for colors and representations, aimed at transfiguring the simple subject to symbolically load it with further forms. This is how the many colorful caves become ancestral references to the mother's womb, or the arched rock becomes a synonym of divine creation. For some years, also telluric forms of volcanos of lava or even of vessels facing the sea routes have been added to the calcareous rock formations of Capri. Ugo's surrealism thus becomes a symbolic figure and also a social criticism aimed at representing the search for hope through the sea, as is the case for many migrants today, in search of a more auspicious fate through the sea routes, but which often turns into in an exodus without a goal, as can be read by one of his canvas that does not represent the face of sailors. Among the paintings of Ugo it feels like an earthly paradise for colors and liveliness of nature, it is a violated paradise, where the human element is confused with the marine and animal taking features between the beautiful and the monstrous that leave a mark in who observes them. Until September 24th the paintings of the painter-corsaro, Ugo Di Martino, can be visited in the exhibition room of Palazzo Cerio from 16.00 to 22.00.